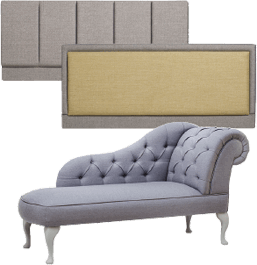 If you're looking for a new headboard then Stuart Jones have a great range of fabric, wooden, oak headboards to complement your new bed or to freshen up your bedroom. This company is one of the UK's leading headboard manufacturers and through them we can offer unique personalised touches by adding trimmings and wood finishes to your own design. We also offer a 'customer’s own material’ service on a selection of products. This means that they will upholster their furniture, or headboard, with fabric that you provide - as long as that fabric meets certain practical demands and conforms to safety regulations. Please visit our Nuneaton store to see the fabric choices and some of the headboards on display.